For someone from the center of all things maize-and-blue, green was quite a part of my life yesterday. At the starting line, sporting the latest in upscale race fashion. 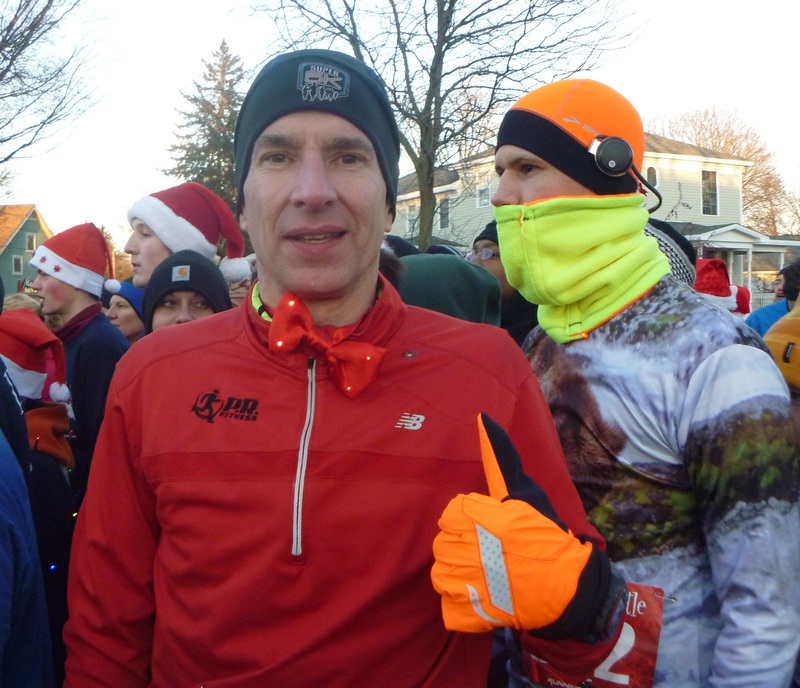 There was the holiday red and green of the Holiday Hustle 5K in Dexter. This run holds a special place in my heart, being my first race, the first race in which I won an age group award, and the first time I broke 20:00 in a 5K. Last year I served as a volunteer, and for some reason found setting up for a winter race to be fun, so I did it again this year. I helped put up tents, string Christmas lights in the registration area, haul water to the finish area, and set up the finish chute – in between leaning over the heater in the warming tent. With the temperature unbudging from the low 20s and a steady wind, keeping warm was a real challenge. But the cold didn’t appear to hurt the spirits of the crowd of runners (nearly 1,100 finishers) and spectators. The Grinch is smiling? Gotta be cold out. Then there was the environmental “green” which already has a prominent place in our house, and in Ann Arbor in general. 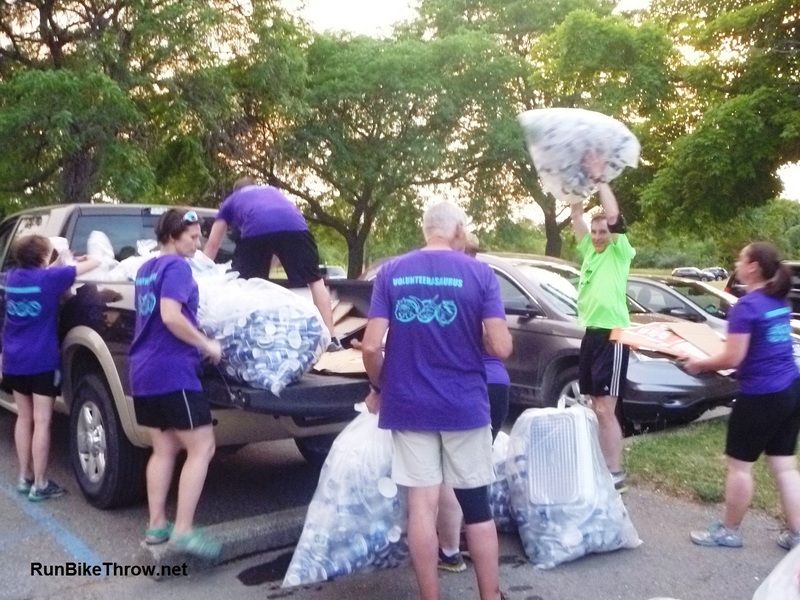 The plastic water bottles we handed out were prominently marked, “Made from Recycled Bottles” so at least some reuse of waste is going on, and we put out recycling containers, so many bottles will avoid the landfill a second time. 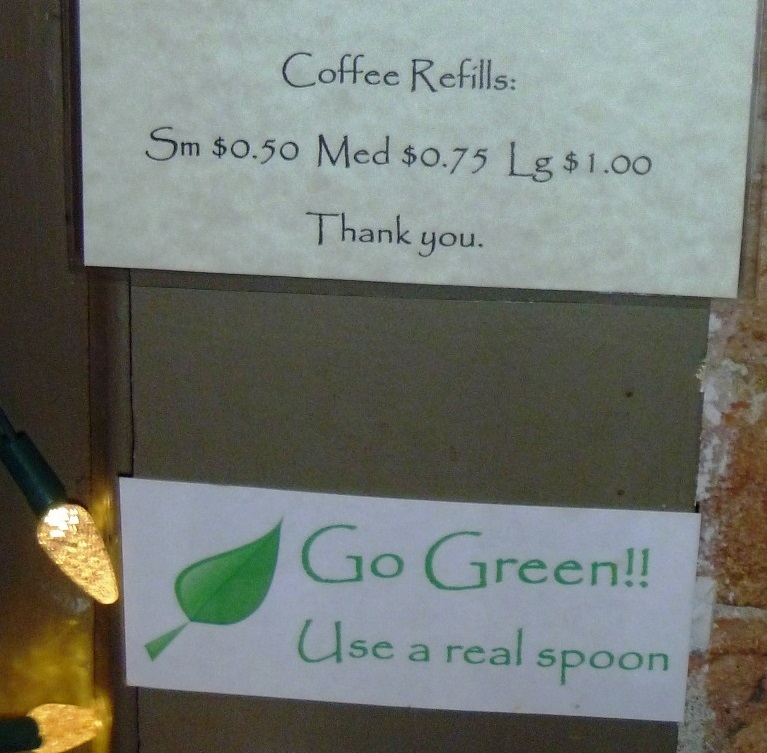 Then there was this sign in the Joe and Rosie coffee shop, where I had lunch and my post-race peppermint mocha. Enjoy it, Tori and Sis….you’re not likely to see this ever again. 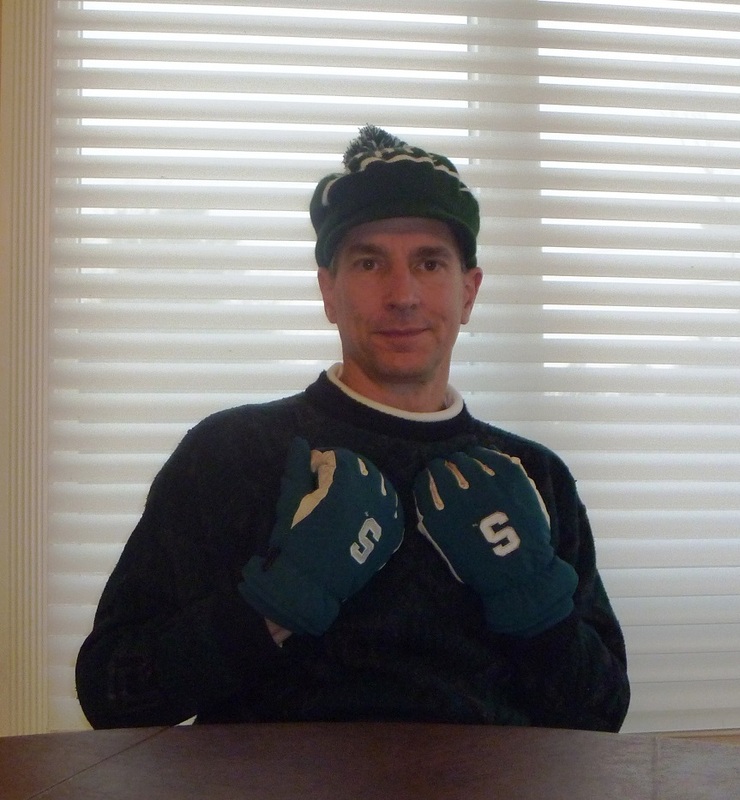 And how can I overlook a certain football game last night, as the Spartans knocked off the Buckeyes to win the Big Ten title. It was bittersweet for this house full of Wolverines, but heaven for my sister and my older daughter (the green sheep in the family). Congratulations, little brother! You done good. Hey, what about my favorite type of green? Wow. How many of us are willing to do that? Sure puts a few chilly hours helping with a race into perspective. 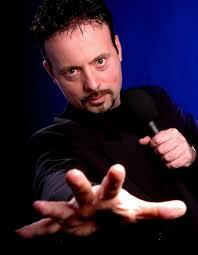 I’m not saying I’m going to follow suit, nor would I suggest that anyone else do so. But I will consider doing something more than we’d planned for. Go green! 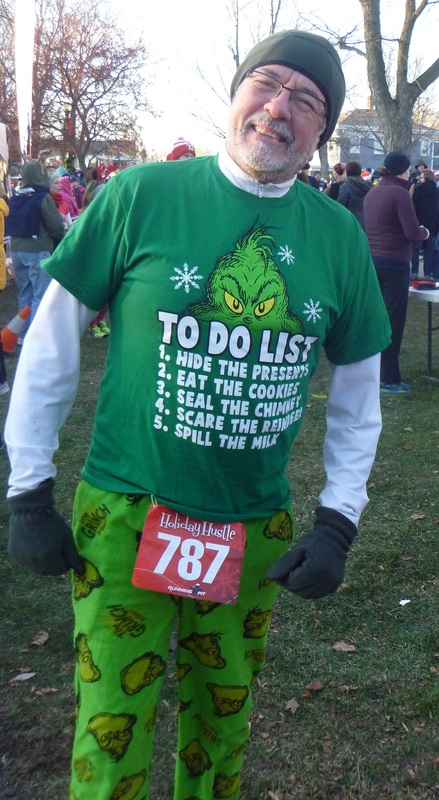 This entry was posted in Running & Cycling and tagged 50, 5K, charity, coffee, dexter, fitness, giving, Holiday Hustle, Joe and Rosie, Marketwatch, MSU, race, recycling, Running, Running Fit, Spartans, volunteer. Bookmark the permalink.